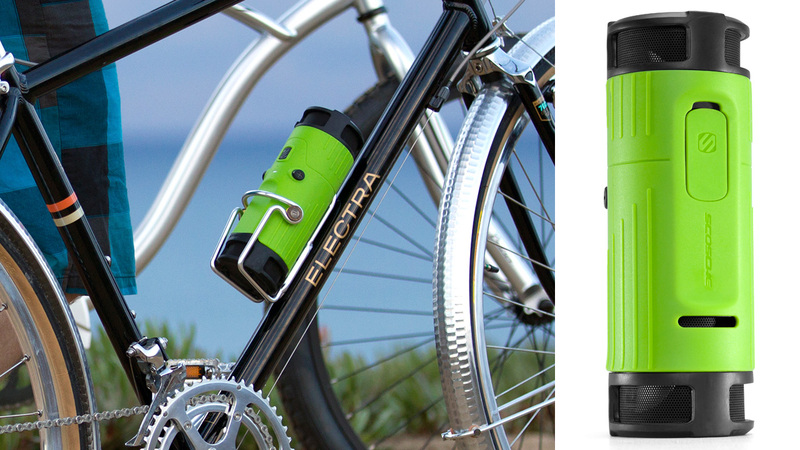 We have another one for outdoor enthusiasts as Scosche has provided me with the BoomBottle, another weatherproof wireless speaker in which has the unique design of being able to fit inside a bicycle’s water bottle holder. On top of easy transport on bicycles and on the links in the golf carts cupholder or clipped to my bag via included carabiner. 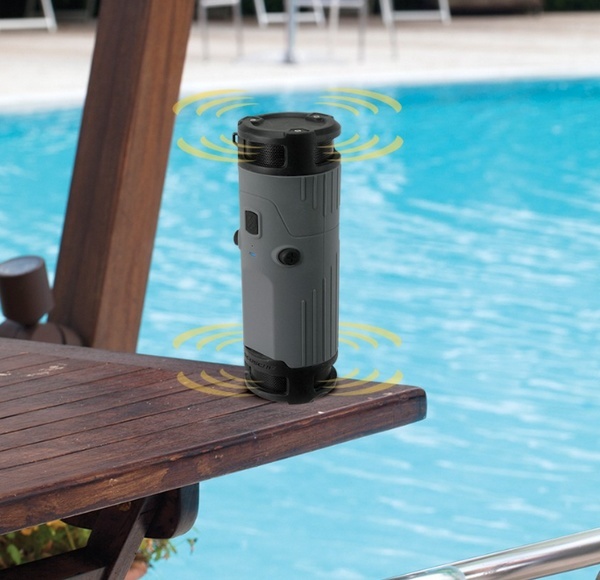 The BoomBottle is weatherproof and durable for upcoming poolside entertainment. While on the topic of features, we have two 40mm drivers, pointed at omni directional cones, and accompanied by a passive subwoofer. It is time to see how those features look off paper and what Scosche’s definition of rugged is. I don’t know about all of you but here in Tempe, we have already hit 100 degrees before May had a chance to turn up the heat, so it is that time to use the swimming pool before it begins to feel like a bathtub. The BoomBottle can easily be a shoe in for an active and outdoor lifestyle based on the design and being constructed to meet IPX4 standards. Connectivity is fast and tells you when connected, there are three buttons on the BoomBottle to play, pause, track forward/back, and volume controls which allows for me to leave my phone in the shade and control the tunes via the Bottle. Knowing that it passed IPX4 standards, I was confident that this device could take some splashing and that it did all while making sure I can hear my playlist while playing volleyball in the pool. It is not quite as loud as some of the other speakers, but it does take a beating and keeps playing at full volume without distortion. If you are someone with an active lifestyle, particularly mountain biking without headphones, this is a great way to take your playlist with you, knowing there are no cords flapping about and was confident that it can take a fall without skipping a beat. 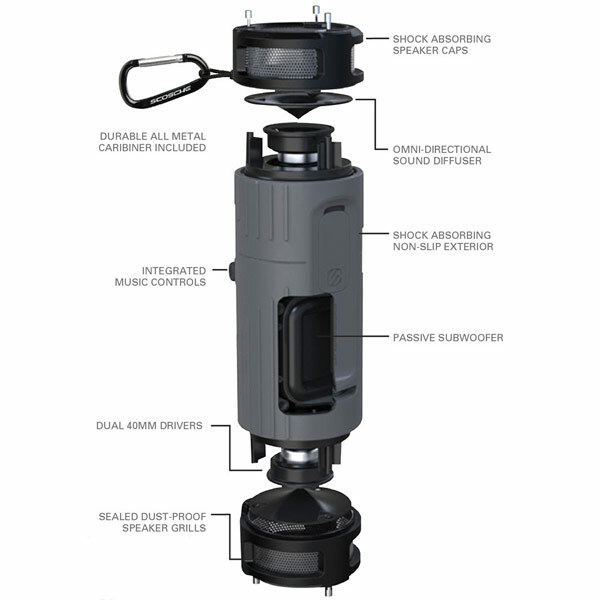 To top it off, there is a built in microphone so it is easy to use just about anywhere as long as it does not get submerged. I was expecting more in terms of the sound volume as most of the time it was used outdoors, the volume was at it’s loudest and could have used just a bit more, both volume and depth as the passive subwoofer does not add much, especially in open areas with loud background noises. While made for easy transport by cycle, it is just as fitting by the pool due to it’s ruggedness and on board controls.